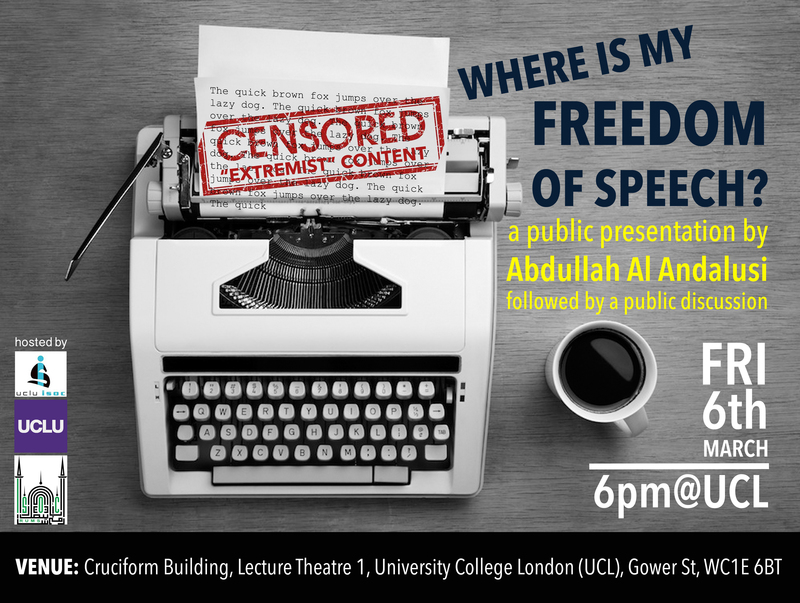 On Friday 6th March 2015 the University College London [UCL] Student Union will be holding a significant lecture on Freedom of Speech at the its massive lecture theatre 1 in the Cruciform Building at UCL at 6pm-8pm. The event will discuss two big questions, Can freedom of speech justify insult? and Does it truly exist in the West or anywhere? and Does Islam offer a better alternative understanding to the current way the West regulates Freedom of Speech? The event will open with an interactive presentation by Abdullah Al Andalusi, and move onto an an open Q/A session that will welcome discussion, criticism and debate from the audience. The event promises to reveal shocking truths about the actual laws that restrict speech in ‘free countries’ will be revealed, and controversial opinions and ideas will be discussed openly and frankly – including a better alternative to ‘Freedom to Offend’ that protects Freedom to Critique and Debate, while encouraging mutual respect and coexistence. In the light of the recent Paris Attacks, as well as rampant Islamophobic murders of Muslims and attacks on mosques, this topic has become highly relevant to Western (and global discourse). The lecture and subsequent public discussion promises to be a MUST ATTEND event for people of all beliefs. To attend, and to see full details, please join the facebook event here.